George W. Resh, 65, of Forks Township, died Friday, July 4, 2003, in St. Luke's Hospital, Fountain Hill. Born: February 4, 1938 in Easton, a son of the late Clayton R. and Anna Krome Resh. Personal: He and his wife, the former Joyce A. Beisel, celebrated their 44th wedding anniversary on June 20th. 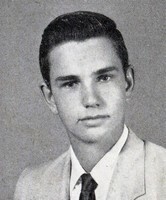 George was a graduate of Easton High School, Class og 1956. He served with the U.S. Army. He retired from Met-Ed, Forks Township, where he was employed as a right of way representative for 30 years from 1964 to 1994. Prior to that, he worked for Ingersoll Rand Company in Phillipsburg from 1959 to 1961. He enjoyed motorcycling and computers. Membership: He was a member of Arndt Lutheran Church, Forks Township. George was also a member of Bushkill Valley Motorcycle Club since 1957 and held various offices throughout the years. Survivors: In addition to his wife, he is survived by a son Guy C., and his wife, Karen, of Mansfield, Mass. ; a daughter, Kimberly Resh, of Bethlehem; a brother, Clayton, of Plainfield Township; two sisters, Frieda Trauger, of Raubsville, and Colleen Hayes, of New Tripoli, Pa.; three grandchildren, Christopher and Gabrielle Resh, and Jacob Tone, and a "granddog", Sandy. Services: 1 p.m. Monday in the Strunk Funeral Home, Inc., 2101 Northampton St., Wilson Borough. Call from noon to 1 p.m. Monday in the funeral home. Burial will be in Northampton Memorial Shrine, Palmer Township.